Sanwa Shōkai (三和商会) was a Japanese distributor based in Tokyo. It was an authorized dealer for various cameras from the late 1930s to the end of World War II, sometimes in association with Mizuno Shashinki-ten and Yamamoto Shashinki-ten. It was a pioneer in the popularization of subminiature cameras, distributing both the Guzzi and the Mycro. The company survived the war; in 1946 it was selling the remaining stocks of the Auto Keef and the Mycro subminiature. (The latter was sold until the early 1950s.) The company also used the "Una" (ウナー) brand for a variety of accessories, both before and after 1945. It is said that the company founded a research center called the Sanwa Photographic Science Institute in July 1949, but that this initiative was short-lived, as the declining success of the Mycro cameras threatened Sanwa's financial health. Some sources say the Baby Suzuka was made by Sanwa, but the name that appears in the advertisements for this camera is K.K. Sankō (株式会社三光). Various companies called Sanwa Shōkai do exist today, but it seems that they are completely unrelated. The dates correspond to the period when the camera is known to have been distributed by Sanwa Shōkai, not necessarily to its full production run. Guzzi (1938–44) and its "Baby process tank"
↑ Its address until 1946 was Shiba-ku Tamura-chō 2–15 (東京市芝區田村町二ノ十五). Source: advertisements dated August 1938 to February 1946, reproduced in Kokusan kamera no rekishi, pp.72–3 and 132, and in Awano, pp.8–10 of Camera Collectors' News no.274 and p.4 of Camera Collectors' News no.277. From 1947 it was Chūō-ku Kyōbashi 3–7 (中央区京橋3–7). Source: advertisements dated July 1947 to January 1951 reproduced in Kokusan kamera no rekishi, pp.182–3, and in Awano, pp.5–7 of Camera Collectors' News no.275 and p.6 of Camera Collectors' News no.276. ↑ Lewis, p.62. This source incorrectly spells "Miwa" instead of "Sanwa" on pp.62, 64 and 68. ↑ McKeown, p.870, Lewis, p.75, and this page of the Asacame website. ↑ Advertisement reproduced in Kokusan kamera no rekishi, p.142. See also the advertisement reproduced in this page of the Media-Planet website (archived). ↑ Corporate profile of Sanwa Shōkai, founded in Tokyo in 1954; corporate profile of Sanwa Shōkai, founded in 1911 and based in Suwa; homepage of Kamera no Sanwa Shōkai, based in Osaka. ↑ Advertisement reproduced in Kokusan kamera no rekishi, p.73. ↑ This camera is attributed to Sanwa in Kokusan kamera no rekishi, p.341. ↑ Advertisements reproduced in Kokusan kamera no rekishi, p.67, in Awano, pp.4–8 of Camera Collectors' News no.277, and in Hyaku-gō goto jūkai no kiroku, pp.47–9 and 71, published here at Nostalgic Camera. ↑ Advertisements reproduced in Kokusan kamera no rekishi, pp.132 and 182–3, in Awano, pp.8–10 of Camera Collectors' News no.274, in Hyaku-gō goto jūkai no kiroku, p.78, published here at Nostalgic Camera. ↑ Advertisement reproduced in Kokusan kamera no rekishi, p.132. ↑ Advertisement on the fourth cover of Nihon Shashin Kōgyō Tsūshin, February 15, 1944, reproduced in Hyaku-gō goto jūkai no kiroku, p.78; advertisement in Nihon Shashin September 1944, reproduced in Awano, p.9 of Camera Collectors' News no.274; advertisement in Photo Art December 1949, p.67, reproduced in this page; advertisement in Asahi Camera December 1949 reproduced in Kokusan kamera no rekishi, p.182; advertisement in Ars Camera May 1950 reproduced in Awano, p.6 of Camera Collectors' News no.275. ↑ Advertisement on p.2 of Nihon Shashin Kōgyō Tsūshin, April 20, 1948, reproduced in Hyaku-gō goto jūkai no kiroku, p.80. 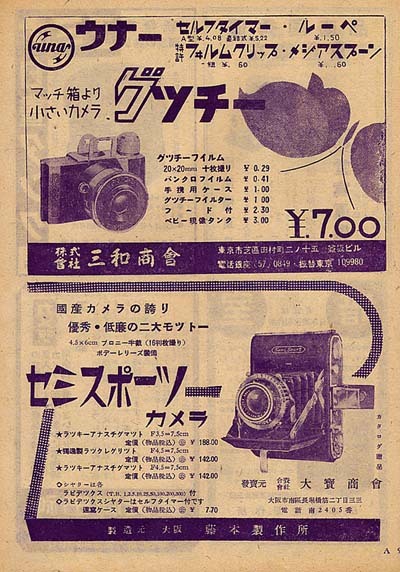 ↑ Advertisement in Photo Art December 1949, p.67, reproduced in this page; advertisement in Asahi Camera December 1949 reproduced in Kokusan kamera no rekishi, p.182; advertisement in Ars Camera May 1950 reproduced in Awano, p.6 of Camera Collectors' News no.275. Ars Camera. Advertisements by Sanwa Shōkai in January 1946 (second cover), February 1946 (third cover), March 1946 (third cover), April 1946 (third cover), May 1946 (third cover), July 1946 (third cover), and February 1949 (p.51). Awano Mikio (粟野幹男). "Gucchī" (グッチー, Guzzi). In Camera Collectors' News no.277 (July 2000). Nishinomiya: Camera Collectors News-sha. Awano Mikio (粟野幹男). "Maikuro sengohen (1)" (マイクロ戦後編, Mycro postwar edition ). In Camera Collectors' News no.275 (May 2000). Nishinomiya: Camera Collectors News-sha. Lewis, Gordon, ed. The History of the Japanese Camera. Rochester, N.Y.: George Eastman House, International Museum of Photography & Film, 1991. ISBN 0-935398-17-1 (paper), 0-935398-16-3 (hard). The company is incorrectly called "Miwa Shōkai" on pp.62, 64 and 80, because of a wrong reading of the kanji characters 三和. The Baby Suzuka is wrongly attributed to Sanwa Shōkai on p.75. McKeown, James M. and Joan C. McKeown's Price Guide to Antique and Classic Cameras, 12th Edition, 2005-2006. USA, Centennial Photo Service, 2004. ISBN 0-931838-40-1 (hardcover). ISBN 0-931838-41-X (softcover). Pp.869–70. Nihon Shashin Kōgyō Tsūshin (日本写真興業通信). Hyaku-gō goto jūkai no kiroku (百号ごと十回の記録, Ten records, every hundred issues). Tokyo: Nihon Shashin Kōgyō Tsūshin Sha (日本写真興業通信社), 1967. No ISBN number. Advertisements on p.78, corresponding to the fourth cover of the February 15, 1944 issue, and on p.80, corresponding to p.2 of the April 20, 1948 issue. Photo Art. Advertisements by Sanwa Shōkai in December 1949 (p.67) and May 1950 (p.99). This page was last edited on 20 September 2017, at 10:43.